way around the ring at a 45 degree angle. 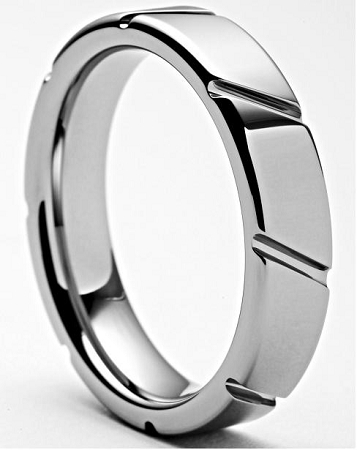 Super stylish and unlike any other tungsten ring, this unique 5mm style tungsten ring is sure to turn heads! This ring also comes in a 8mm. This is a great ring. Perfect in size,weight,fit and price. The communication was great with the company...I ordered the wrong size and the exchange was hassle-free. Thank you. Love the unique style, thank you for the quick and best of all, free shipping :-) We will return! 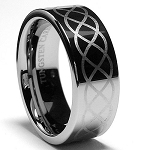 Such a cool, different tungsten ring. This is our 3rd order from Tungsten Fashions and we couldn't be happier. Great selection and very friendly. The ring is beautiful and fits well. I will be happy to wear it when we get married. It's a beautiful ring, heavy and very stylish. I hope he enjoys the ring once he receives it as a gift. Beautiful design which gave a plus to my hand. Excellent service and support.. All my orders were shipped before than expected. It's awesome.